Oh. Wow. From the description I wasn’t expecting a first place! This is a great boost on the Znopresk reputation in Fruinia. The Marcello has gone really better than I expected, the truth. It’s actually a very comfortable car to drive in Beam. It’s obviously slow, but it’s strangely nippy in the normal city and suburb speed range. 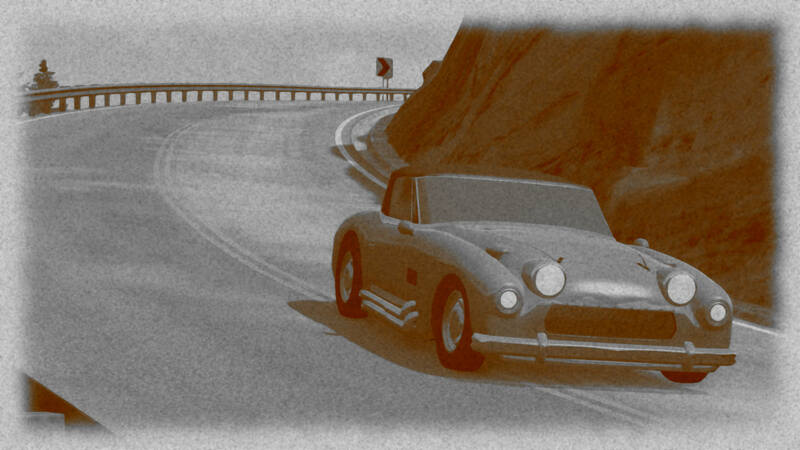 Without straights and hills to climb, it can keep up with most cars in this class. Not bad for the Bergmann Special so far! It’s reasonably quick so far it seems (in spite of rather poor fuel economy, probably because you’re driving the thing absolutely flat-out all the time! ), and I’m glad its unique, err, charm, has not gone unnoticed by the spectators! A little yellow coupe meandered its way slowly into the paddock area. Passing many other competitors from earlier who had arrived sooner, the driver guided it to an empty pit space marked in Kanji. Waiting there was Hideki Akiyama, standing tall in a crisp white lab coat and wearing a yellow hard hat. He turned to his assistants, ordering them to prepare the tools for partial tear down. It took them less than an hour to remove critical components, measure them, and put the 360cc motor back together, properly tuned. Suzume had sent the team with numerous extra seals and consumable spares for this purpose. Their quest from senior management required them to attempt to tear down the engine far enough to remove the head, inspect the piston crowns, measure valve lash and camshaft wear, check distributor tolerance, and investigate any leaks. The first stage was uneventful, mechanically speaking. Other than a slight propensity for the prototype Kei car to oversteer, everything was in fine condition. OOC: If there were an ACTUAL Kei body available, this thing would be so much better. I’m actually pretty impressed with how well the engine is moving a car that is waaaay too heavy for it. Glad to see it performed reasonably well without too much issue (apart from being slow). It’s very fast! But with only 1 driver, a random roll higher than reliability is immediately 0:30 added to the base rather than 0:15. (The times in hours are just the time in minutes around the loop with those random rolls added). There are actually two cars that are even more loud, but I think that’s due to a bug. My PMI Polloi sounds like it’s about to crash the game for some reason, despite only having an I3 engine. And there is another Boxer-6 engine that has the same bug. In both cases it is as if there are suddenly 2 engine running (both as loud as yours) between 4 and 5k rpm. Having seen the first class running ahead of their own, Michael Evanham and Edward Hampden were optimistic. Evanham had this to say to our reporter. The two British racers were looking confident, but cautious as news of crashes began circulating throughout the paddock. Everyone on the British Isles is cheering for the British Bulldog and his gallant steed to stand high after todays day of racing. (Somewhat) kicking off day two: the HTA Emperor MGF, powered by 1.4 liter boxer-4. It rumbles loudly without muffler, giving the impression of racing spec vehicle. Great is consternation then when the car stalls twice on the starting line. Driver and co-driver need to get out and push the car to the side to change a spark plug. And with some delay, off she goes. It’s almost a miracle they got here after the border incident of last November, but Lahm and Huth will be representing East Toramania in the most modern the country has to offer, the TMW Frieden RW '47, carrying number 8. The Barricada 1350MM Superaerodinamica was late-30s pre-war concept derived from aerospace technology. In privateer hands, the car is competing here in the Corso. A Corso exclusive here, as a brand new prototype from the East appears at the start: the Suzume Shiso Hyu, a name that probably means things, for a car that is an aesthetically pleasing city delivery van. Number 26, the FABEL Etoile 1400 Super, with a rumbling four cylinder boxer engine, stands at the start line. The little car with racing modifications, but not all together that different from the standard vehicle, is the first endeavour into racing by the Belgian company. Drivers Kocken and Steunebrink, so I’ve been told, have brought with them five crates of Belgian beer for during the Corso. It is unclear whether this is meant for after and between the stages, or for consumption during the actual race. The Bangkok Aeronautic Factory Romulus is, as the name hints, an aluminium sports car from what we might still better know as Siam, powered by a small experimental 1,4 liter engine. This is by far the most exotic contestant in the Corso, but the Siamese company is trying to get itself known globally, having known a big boom after the stability created by the 1949 constitution and the growing domestic economy via rice exports and US post-war aid funds. The F.A.O. Lollypop 1100 Monte Carlo might be a privately owned car, but it’s been modified for rally, with a short gearing ratio and the interior stripped to just two seats. It’s pretty quick for a car so low on horsepower as an end-result. The Juggernaut Automotive Familyman is yet another extremely well driving car from the company. You can see it being thrown around on the dirt roads and just gripping when it needs to. The Wentworth Womble, number 88, driven by Smith and Brewer, who are ultimately the designers of this car, drags itself out of San Martino. The anemic engine has serious issues getting started. It is odd that the engineer is not able to solve this. Once the little roadster gets going, it moves well enough though. With a small 1.4 litre V8 rear-mounted engine the Corsa 1337 Sports is a one-off car competing here in the Corso. It will be interesting to see how the little car holds up in terms of reliability and drivability – two notorious issues for prototypes and non-production cars. With the #76 car, a second Juggernaut Automotive Familyman appears at the start. Driven by Bolognese and the young American known as W.N. the home-adapted Juggernaut Automotive CS will try to beat the original, as well as potential strengthen the Juggernaut Automotive’s position in the constructor standings. A Bramble Bismuth but with an adapted compact commuter car boxer engine, number 97 at the start. Bramble is gambling for manoeuvrability here clearly. The car is driven by Chamberlain and Moore. The car is a prototype. You can tell that because it says so in the name. Though if it didn’t say that, we’d be calling it a Rennen 1.4 litre racing engine strapped on a ladder frame together with some refurbished car bits. But credit where it’s due, the Erin Motorsport SP-1 B is not a slow car (that’s credit for Rennen), but the handling on the dirt roads appears to be abysmal (that’s credit for Erin). Maybe that perception can still change. The second car of the company entering the Corso, the Znopresk Z1452 is a sturdy family car with a 1,4 litre boxer-4 engine. This car has been stripped and the engine has been retuned for endurance rally. The front-wheel drive system is not having any issues with the hilly gravel roads leading up to the climb into the Arpeninos. A van. It’s a van. It’s also called Van. S Van. Aeros S Van. And someone within that company had the bright idea to adapt one for racing purposes. And you know what, at least outside of San Martino, with that Boxer engine, and compliant suspension, it doesn’t even look half bad at it. Designed by an enthusiast and put together on a junk yard, no one is surprised when the Lutoza Prot. 01 has some technical issues in the first 50 kilometers. Apart from that, the car drives well. Hastily constructed and hopefully more reliable than it looks, the LSV Mark ‘‘Nuts’n’Bolts’’ is a Mark RS platform with a larger engine and a roadster body. The little roadster looks extremely planted on the gravel for a light rear-wheel drive car. The WM RatonAereo 657 is an exact copy of the RatonAereo 654 in the lower class, but under the bonnet it’s a completely different car. Powered by a race-spec Boxer-6, this loud sports car is going to test the longitudinal FWD system to its limits. 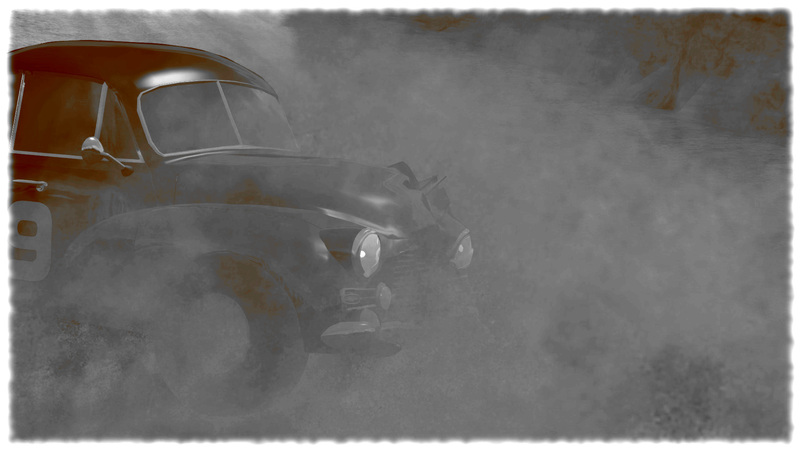 The engine itself is however the first to throw up trouble, and when the car suddenly starts bellowing black smoke, the drivers quickly learn the oil gets burned through more rapidly than expected. Luckily, they are carrying extra. A small 1.4 litre Dutch V12 engine. We are not sure how that happened either. The one-off Meijer Azure with #869 sounds great, but at least at the start it does not look blisteringly fast. Local luxury brand Cisalpina has entered a Cisalpina Tipo 50 Spyder, powered by what is basically half an exotic car’s V12. This car with number 50 is the one that made Cisalpina a famous brand in less than 2 years, with that intricate inline-6 and luxurious finishing. It is not a cheap car. The vaguely odd-looking (especially those lights and fixtures used) Eagle 112E is a cheap utilitarian front-wheel drive car. The large 3-cylinder produces ample torque and seems well suited for back road driving. A sturdy American-looking convertible, but with a quirk; the Birmingham Rumor R4 is rear-engined, and has a boxer-4 engine. Unheard of in that segment, the car is a concept car and is here for testing. The bigger brother of #92, this one carrying the number 99, the Penrose Customs 1400. The engine makes a mighty noise, as a Penrose apparently befits. However, the chassis has issues with either the power or the gears are not adapted to the bigger wheel sizes; the #99 car appears to be highly unstable up to the point of undrivable on throttle. They have not even left San Martino and they’ve already ran into a fence after losing control. The car is damage but can continue, and they do so in high gear and at half throttle. A retuned Rennen-powered LMC Spectre RS1400 is the debut of this – self-advertised – luxury brand. In any case the exterior of the car looks exquisite. And the drive, at first sight, is equally gentlemanly. Hausmann and Schmied, in a purpose-built Tannberg Gladius 1.3 R. The car has a rear-placed boxer engine with 6-cylinders. With almost 150 claimed horsepower, it is the most powerful in this class. A spectacular finale on paper this. The rumble of the HTA Emperor MGF tells us it really needs to be in first gear on the steep parts to keep up speed, it’s hoping that the engine will hold this punishment. The Frieden RW is being pushed to the limit by Lahm. Huth has draped an East-Toramanian flag over the door and is slamming the side with his hand with a certain impatience. You can hear the car going up to second, and then down to first again, buzzing the limiter. Too little power to do this climb in a higher gear. A beautiful sight to see the Barricada 1350MM Superaerodinamica go up into the Arpenino mountains. It is clear though the car was a concept for highway speeds. The gravel roads are giving it a hard time. The Suzume Shiso Hyu is turning out to be quite a capable little car on the gravel, clearly it handles responsively and that gearbox is seems to be nicely tuned for twisty uphill roads. They don’t have mountains in Belgium, but little do you notice this when the FABEL Etoile 1400 scurries up the Arpenino mountain roads. Some technical issues with either the oil pump or the throttle body cause some delay as Steunebrink tries to figure out what is wrong and how to mend it. Some time loss for the Bangkok Aeronautic Factory Romulus as some rare wheelspin on a steep climb slides the car towards the banking and shreds a rear tire. The F.A.O. Lollypop 1100 has some small slip ups but in general the little car climbs up the Arpeninos like an agitated mountain goat, it’s amazing to see, actually. Some minor issues for the Juggernaut Familyman here, as the driver got a bit too arrogant after that first sector and started throwing the car hard into the hairpins. Although no accidents occurred, the sudden oversteer that the car suffers when pushed, made some three-point turns necessary. 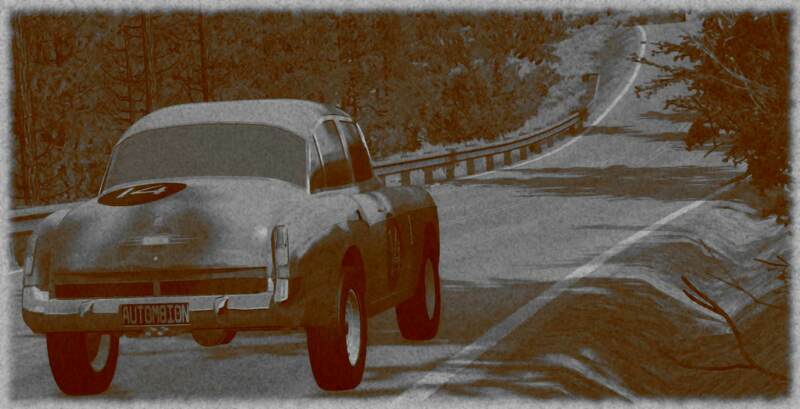 Despite being designed and driven by two people from the Aero-industry, I don’t think we’ve seen a car ascending the Arpeninos so slowly as the Wentworth Womble, even the sheep and goats along the roads don’t lift their heads for this one. The Corsa 1337 Sports is giving a good account of itself on the gravel roads leading to the summits of the high Arpenino mountains. The little rear-engined car actually makes quite a good rally car by the looks of it. Bolognese and the young American known as W.N. are standing still in the #76 home-adapted Juggernaut Automotive CS. There appear to be some issues with the non-standard carburettor. The engine of the Bramble Bismuth has the tendency to stall under 2k rpm we have the impression. So it’s not a surprise when the #97 holds a technical stop up the slopes for Moore to fiddle around with the engine settings. Mild improvement at least for the lone driver in the Erin Motorsport SP-1 B as it clambers further into the mountains. The tempo is lower, and so is the risk of losing control. This is perhaps a wise choice considering to co-pilot or technician is immediately available when trouble occurs. Minor issues for the Znopresk Z1452 as something is amiss with how the front-drive system interacts with the steering. Some repairs halfway on a the climb to one of the peaks are needed. 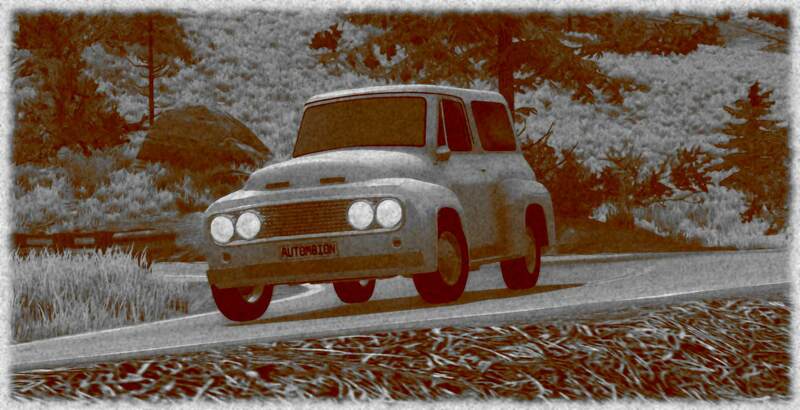 The peasants of the Arpeninos mountains might scratch their head when this passes of all cars, but the Aeros S Van is clambering up the mountains pretty well, even if not terribly fast. The Lutoza Prot. 01 maybe lacks just that bit off power – at least in the rev-range the gearing allows – to send it up the steepest parts at competitive speeds. The LSV Mark ‘‘Nuts’n’Bolts’’ is not the least powerful car in this category, far from, although it’s quite heavy. It appears to be the long gearing that causes the biggest issues climbing up the Arpeninos. It is composed and does not spin its wheel, but the car does not really manage speeds over 40 km/h when the trails become steep. The WM RatonAereo 657 makes good progress, the racing engine is pulling the car up the hills at remarkable speeds. There are some angry shouts from farmers along the track at some point, something about horses, loud engines and not again. The big climb towards the peaks of the Arpeninos was taxing on the small V12 of the Meijer Azure. Even with the cold outside temperatures the #869 car needs to stop to let the engine temperature drop. There is some damage to the body from scraping the guardrail at some point as well, the little roadster had some understeer issues, but nothing mechanical was hit. Obviously the Cisalpina Tipo 50 Spyder is not at home on the gravel and really has no business trying to climb steep mountains, but even so the car is bravely holding its own. Reliably though the engine is, the drive system of the Eagle 112E requires some attention from the mechanic on the rough climb into the mountains. It appears something has slightly shifted in the steering. The car lunges at certain moments from the high torque stresses while steering. Amazingly manageable for having all the weight on the rear, even on these dirt roads. 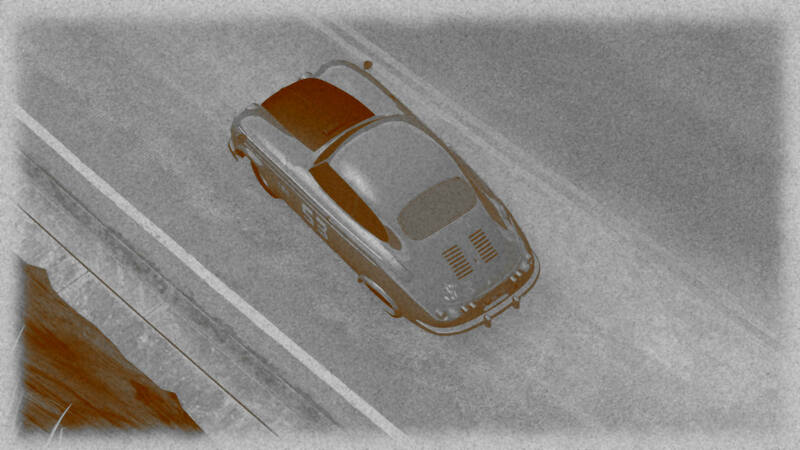 That part was well tested before the Corso in the Birmingham Rumor R4, the part were this is still a concept car is reliability, and fairly soon after really pushing the engine uphill, oiling issues pop up with the boxer. Things are looking pretty bleak for the Penrose Customs 1400. The car is simply not at home on the gravel roads and it spins a few times more. Rubbing it thoroughly is when the car stalls on a steeper part and it simply can get going anymore, either stalling or spinning in place. With some help – after having cooked the clutch and letting that one cool – they can finally get going again. A tiny slip up from the LMC Spectre RS1400 but the driver of the #21 car makes it look like it was gracefully meant. This includes the slight escapade into that ditch, and the subsequent stop to marvellously bent down and inspect the drive line after that rock diligently percussed the underbody of the car. Despite the inherent imbalance of the engine lay-out, the Tannberg Gladius 1.3 R is being driven impressively hard on the gravel tracks climbing the mountains. Hausmann is doing an absolutely fantastic job in keeping control, although the tuning of the suspension probably has a big role in that. The number 8 Frieden RW is used to Central European Winters, and you can see it can deal with the frosty roads. It’s a first time abroad for Lahm and Huth though that’s not officially confirmed. What this reported heard though is that they stopped the car on the tops to go for a walk and take up the view. Only good news for the Suzume Shiso Hyu clearing the highest passes over the Arpenino Mountains. There haven’t been many cars who’ve been this at home there. Spectacular roll from the Epoch Model 10-2A Race, which seems to be having trouble with the rear brakes on down hillsections turning the car round. The car ends up back on its wheels after two full rolls, so it can continue, but I’m sure the driver and co-pilot are shaken by the incident. Scary moment for the FABEL Etoile 1400 when the rear comes round over an ice patch, but beautifully held and recovered by Kocken. Our reporter reports their words, heard through the open window: “godverdoeme miljaar dedju.”, whatever that may mean. The Bangkok Aeronautic Factory Romulus is a balanced car, appears to be very controllable and very nimble. Maybe it’s not the fastest car around, but judging on the driving style it’s one of the most fun an forgiving, the F.A.O. Lollypop 1100 performs about as surprisingly good as its name is tacky. Predictable tentative driving on the icy roads from the Corsa 1337 Sports with all that weight on the rear wheels. But so far the prototype has managed to run the parcour without any technical issues. 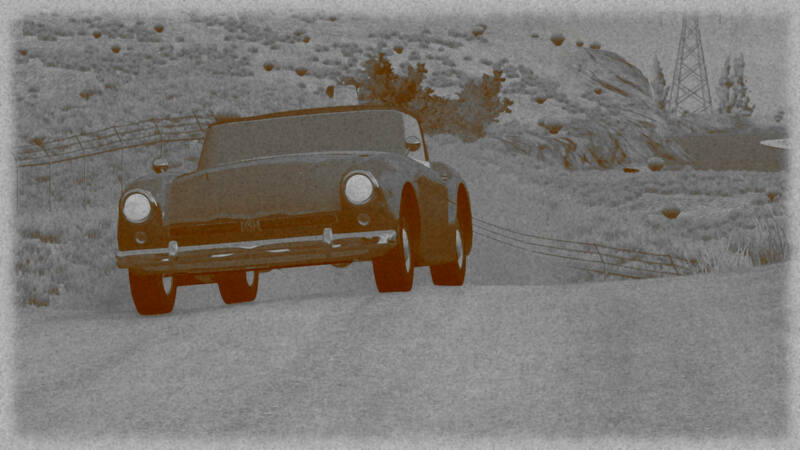 As its factory brother, Juggernaut Automotive CS becomes uncontrollable quickly on the icy roads of the high Arpeninos. Applause from a group of local herders as the Bramble Bismuth of Chamberlain and Moore spins on an ice patch and makes a perfect pirouette. It can continue without losing much time, but it becomes clear why this car had incidents during the test phase according to Bramble. May it be better on the twisty paved roads ahead. Bad brakes and continued traction issues wreck havoc on the Erin Motorsport SP-1 B. It has bumped into the guard rails up to five times now already, though the car is still moving and the driver refuses to halt and inspect. We are fairly certain those last few bumps have disturbed something in the steering or wheel alignment. Understeer for the Znopresk Z1452 on the ice, but in general the cars seems to drive stable and safely. However, as smooth as it cruises, so erratic the steering becomes in sharp turns. This remains the pain point of this car. 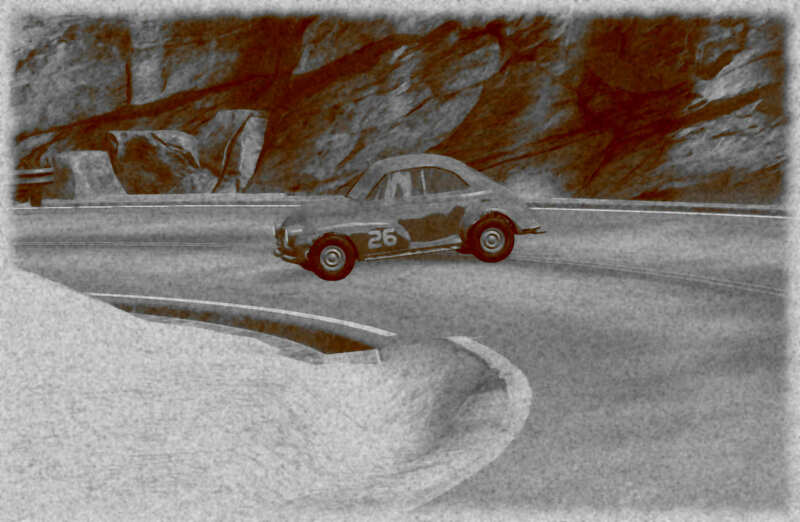 Minor issues for the #62 Aeros S Van as the driver and co-driver actually cause a small fire to some isolation rubber by turning the heating full on in the high freezing mountains. Composure remains the key word as the LSV Mark ‘‘Nuts’n’Bolts’’ does not let itself be caught out by the ice patches on the roads in high Fruscany. The descent from the Arpenine peaks is always a dangerous one. Amazing run from the WM RatonAereo 657 through the Senators’ Pass, but when they enter Previ, a new stop is needed to check the engine. It seems the #657 is suffering again from issues with the oil or oil pump. Well kept under control by the Dutchmen in the Meijer Azure as the car loses traction on an ice patch and starts sliding. The car has been tending towards understeer visibly, and that suspension set up might have saved the car some serious trouble here. The brakes might be the weak point of the Cisalpina Tipo 50 Spyder, and this might cause issues on the descent from the Arpeninos. Handling of the #50 roadster on the ice patch has been controlled, and mechanically the expensive car is holding up. That is not always the case with such intricate machines. Understeer and brake lock-ups plague the Eagle 112E on the icy roads. This culminates into a crash and a spin, but luckily without any serious damage. And the car can quickly continue. Frosty roads are the big test, and progress is gingerly, but the Birmingham Rumor R4 gets down into the Fruscanian foothills without too much hassle. There is a second service stop needed to replace the engine oil again, but the team manages to limit time loss. If cars could tiptoe; the Penrose Customs 1400 would. It is extremely difficult to make speed on the frost-patched surfaces this high through the Passo Senatore, but Hausmann and Schmied are just continuing with their impressive run in the #53 Tannberg Gladius 1.3 R.
And the Frieden RW rolls over the line. The aged family car will have won over some hearts. 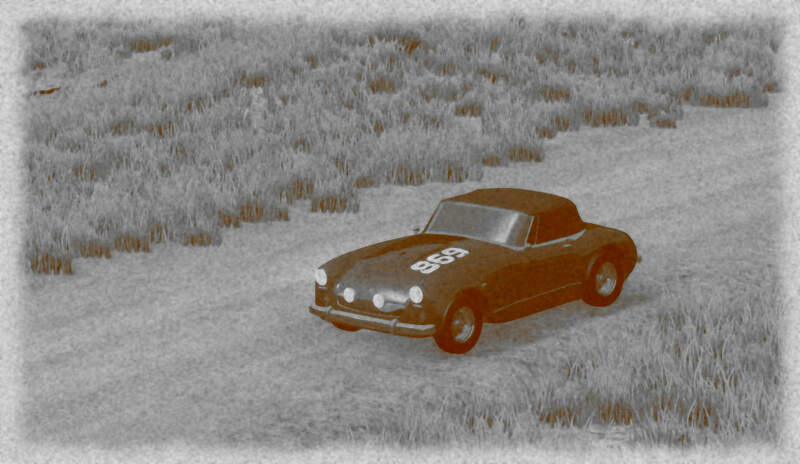 It may not look like much, but this run has proven it is a dapper car. It’s a pity for a car so beautiful, but whether due to hitting something on the way or due to old age, the Barricada 1350MM Superaerodinamica is standing stationary along the Via Fruinia. The front axle is bent and the steering is all but lost. The team is working on repairing the car, and in time even a local mechanic arrives with donkey-drawn carriage. Rudimentary repairs make the vehicle moving again, but alas, the Superaerodinamica crosses the line outside of the allowed 10 hour time. This is a DNF for this stage, but at least it made Fienna, so with some repairs it can run the second stage and still compete for some points. The most amazing technological marvel of the Japanese Suzume Shiso Hyu might just be the brakes. The little delivery vehicle visibly brakes later and harder than other entries. Remarkable also that a concept car turns out to be reliable enough to drive over 6 hours without any mechanical issues. Disappointing run in the end from the Epoch Model 10-2A Race, with a roll and a number of spins. The rear of the car really seems to let loose to easily in the mountains. Down the twisty but ever more opening backroads between the Arpenino foothills and the Via Fruinia, the FABEL Etoile 1400 lives up to its reputation as budget racer. The little Belgian is nippy and good on the brakes, and simply looks fun to drive. Like a lightining strike in clear blue skies, the F.A.O. Lollypop 1100 spins around. Once on the paved Fruscian roads the heavy braking and high speed cornering prove to the Achilles heel of the small car. Luckily the little contraption proves to be quite sturdy. Still the final time is not what it could have been. Was there ever a smile so brief as that on the faces of Smith and Brewer in the #88 Wentworth Womble, enjoying the twisty paved turns towards the Via Fruinia, all joy left driving the Wentworth once actually on the Via Fruinia. With a top speed of not even 90km/h, they are passed even by cars form the lowest class competing. This made worse by suffering the indignity of having to stop for an overheated engine while going only that slow. Minor spin from the Corsa 1337 Sports in a high speed corner on the Via Fruinia and a stalling engine cause some loss of time, but apart from that, a good no-nonsense run from this one-off vehicle. All-in-all a good run from Bolognese and W.N. in the #76 Juggernaut Automotive CS. They finish with a time close to the original factory-spec car, and amazingly, with much less fuel used. A nippy car the Bramble Bismuth, good on the brakes and stable in the corners. The #97 car is making up for time lost on the ice and gravel with great driving from Chamberlain. As we expected, the Erin Motorsport SP-1 B is quite allover the place on the twisty roads down towards central Fruscany. By the time it reaches the Via Fruinia, it is battered and dragging to the sides and shaking vigorously, but still going. All-in-all, a confident run from the Znopresk Z1452. Despite some steering issues, which might be mire related to the basis front-wheel drive system the car uses, this vehicle is safe, competent and reliable. The driver declared upon arriving in Fienna that the descent towards the Via Fruinia had been diappointing. A bump with a rock, which he did not really see in the cabin overhanging the wheels, apparently caused a small collapse of the left front suspension. Top speed on the actual Via Fruinia seemed hampered as well for unknown reasons. It was an unsatisfying ending that followed a good start by the Aeros S Van. It was after declaring all that, that the driver finally looked back at the car. The driver is clearly struggling with the gearing off the Lutoza Prot. 01, also caused by the power curve that doesn’t give much oomph early on. Further time is lost due to a stuck rear brake disc in the descent towards the Via Fruinia. 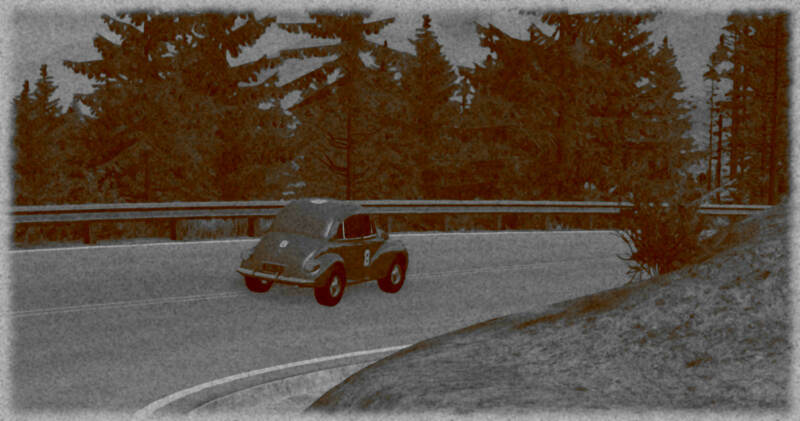 The car is rattling a bit, but overall the reliability of the LSV Mark ‘‘Nuts’n’Bolts’’ has held up. Should LSV decide to produce this car for sale, it might well be a success – with a livelier gearbox even a great success. Fienna has heard the arrival of the WM RatonAereo 657. Even with the technical issues in keeping that demanding boxer-engine lubricated, it has set a very competitive time by the looks of it. It feels odd saying this about a V12, but while the Meijer Azure is a nimble car - that actually looks fairly easy to drive - we feel it lacks the speeds to really challenge the good times here. It looks like a blast to drive through the corners, but extremely nerve-wrecking as well. The Cisalpina Tipo 50 Spyder shows great cornering ability but you do need to get the car stopped. Considering its relatively low weight – still well under a ton – the brakes are clearly the issue here. Performance on the Via Fruinia isn’t blistering either with only 100 horsepower, but somehow, and due to no technical issues whatsoever, the #50 car seems to be going places faster than is expected. Top speed was never a priority with Birmingham Rumor R4 but that does not mean it’s not capable of high speed cruising on the Via Fruinia. Yet, despite it’s bulky appearance, the open but twisty roads of the low hills are were the car seems best at ease. This is truly a testament of the excellent suspension tuning of Birmingham. Being amazed, like us, and I presume happy, to have made it past the icy roads of the Arpeninos peaks, the Penrose Customs 1400 emerges into lower Fruscany. While the more open and dry paved roads are – with sufficient short shifting – more its habitat, bad luck keeps following the #99 car, as the front left tire, misaligned ever so slightly from the crash at the start, bursts. This is some additional unwanted delay. The trip through Fruscany, from high hills to low lands and the majesticVia Fruinia has gone smooth for the smooth LMC Spectre RS1400. Rennen generally knows very well who they give their engine to, and LMC is well on the way to prove with this #21 car that it is developing a gem of a car. Even though we might doubt their claims of a near 120 mph top speed. Schmied has had no work, and Hausmann is smiling so much he cannot really be considered having worked hard either. It’s just the machine itself that took all the dirt, loose grit, gravel and ice this stage threw at it. Usually we are more in doubt as to who run the best time, but when you arrive early enough to scare the race organisation into rumour of unseen shortcuts and blast past the line at a blistering 200km/h, it’s hard to ignore the Tannberg Gladius 1.3 R for what it is; a winner. It’s true that the V12 of the Azure lacks power, I could have gained 24hp by sizing up the exhaust but that would have killed reliability big time. I’m happy 001 passed all stages. Well, now there is reason to put it into garage than scrap yard. All sectors. If I understood the rules correctly, there are 3 stages for each class. Still, congratulations - seems like your junkyard contraption performs much better than mine (R.I.P. Eagle 102).